Small Business Saturday 2018 is right around the corner. Join the Chamber of Commerce and area business to “Shop till we Drop”! Small Business Saturday is an American shopping holiday held on the Saturday after Thanksgiving, during one of the busiest shopping periods of the year. In rural areas like Okeechobee it is important for the community to do their shopping in local small businesses. In a recent poll, when an individual spends $100.00 in a small business $68.00 actually stays in our community as opposed to $100.00 spent at chain stores, where only $43.00 stays in the community. 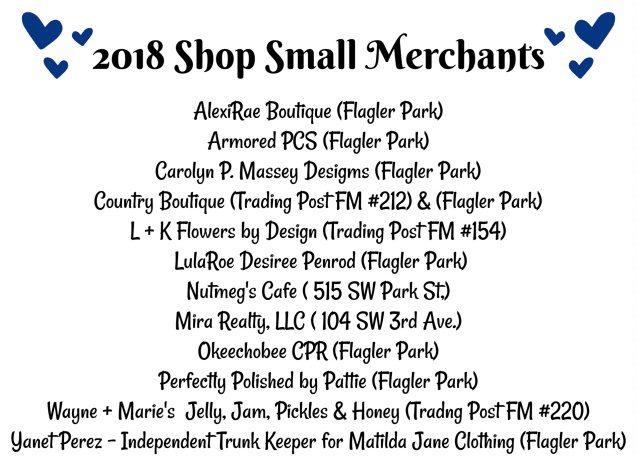 Okeechobee has a fantastic Small Business Saturday planned with great deals and offers from every participating business, shopping sites, prizes, charity food vendors and surprises all along the way! Please see the information below to learn how to participate. I hope you’re as excited as we are! Small Business Saturday is a day for our community to come together and support our local businesses. By supporting our local businesses we keep our citizens employed and the local economy flourishing. We are asking that instead of leaving town to shop 'Black Friday' that you stay in town and 'Shop Small Saturday'. American Express will send you an array of FREE marketing materials for Small Business Saturday. They will send you everything from flyers to door mats, to pens and save the dates!